Swimming is a popular activity, both for recreation and competition. The physics of swimming involves an interaction of forces between the water and the swimmer. It is these forces which propel a swimmer through the water. In order to swim, a swimmer must "push" against the water using a variety of techniques. There are four major techniques, or styles, used for swimming. They are, Front Crawl (freestyle), Breaststroke, Backstroke, and Butterfly stroke. In competitive swimming these are the four techniques used in the numerous swimming events. Out of these four, Front Crawl is the fastest mode of swimming. In order to float in water an object must be less dense than the water. This difference in density causes the object to float. This happens by way of a buoyancy force that "lifts" the object. The principle behind this lift is called Archimedes' principle, which states that any object (regardless of its shape) that is suspended in a fluid (such as water), is acted upon by an upward buoyant force equal to the weight of the fluid that is displaced by the object. When an object is placed in a fluid such as water, and floats as a result, the part of the object that lies below the surface of the water displaces a water weight equal to the weight of the object. This weight is equal to the buoyant force pushing upward on the object. The amount that the object sinks below the water surface corresponds to the equilibrium point, in which the object weight is equal to the buoyant force pushing upwards on the object. Furthermore, the buoyant force acts through the center of buoyancy, which is the centroid (center) of the immersed part of the object - this is the volume of water that is displaced by the object. For the object to maintain its orientation in the water (i.e. not rotate) this buoyant force must pass through the center of mass of the object. 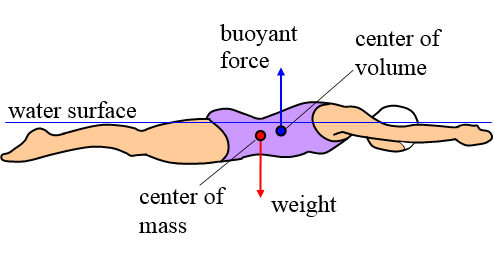 If this buoyant force does not pass through the center of mass, and is offset from it as shown in the figure below , then the object will rotate until the buoyant force passes through the center of mass. At this point rotational equilibrium is reached. 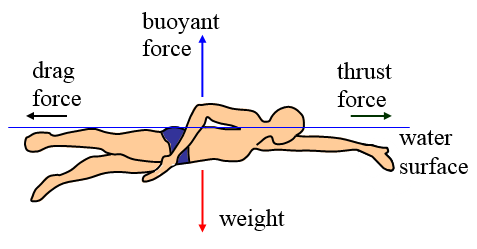 In the figure below the buoyant force acts at a point that is to the right of the center of mass and as a result will cause the swimmer to rotate counterclockwise. In addition to eventually reaching rotational equilbrium, an object floating in water will eventually also reach translational equilbrium. This is when the upward buoyant force acting on the object is equal to the weight of the object. When both of these conditions for equilibrium are reached the object stays stationary. An object that is in equilbrium will always satisfy both translational equilibrium and rotational equibrium. A swimmer propelling him or herself through the water has four basic types of forces acting on him or her. These are illustrated in the figure below . By moving his or her arms through the water the swimmer creates a thrust force that propels the swimmer forward. For a swimmer moving at constant speed through the water the thrust force is equal to the drag force. The drag force is created by the motion of the swimmer through the water. This force resists the motion of the swimmer through the water. A drag force exists any time an object moves through a fluid, such as air or water. The faster an object moves through a fluid the greater the drag force. 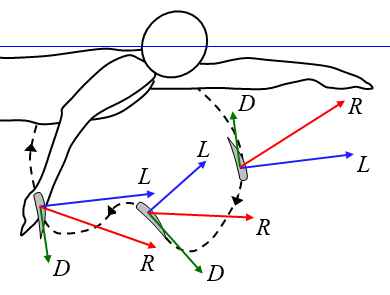 The drag experienced by a swimmer swimming at the surface can be broken down into three components: (1) Pressure drag (form drag) - this is due to the swimmer "pushing" the water out of the way as he swims along, (2) Skin Friction drag - this is due to the friction between the water and the swimmer's body as the water flows over it. This type of friction occurs inside the very thin layer of water directly touching the swimmer's body, (3) Wave drag - this is drag due to the surface waves produced by the swimmer as he swims along. Special body suits produced by Speedo serve to reduce skin friction drag allowing swimmers to swim faster. For front crawl swimming, the thrust force is primarily created by the swimmer's arms (which consist of upper arm, forearm, and hand) as they move through the water . The kicking action by the swimmer's feet also provide some thrust while also helping to keep the swimmer's body level (streamlined) with the water which helps to reduce drag . The hands, as a source of thrust, are a very controllable part of a swimmer's technique and are therefore an important performance area to optimize for competitive swimming. The swimmer's hands mimic an airplane wing in the way they generate force as they move through the water. This is illustrated in the figure below . Just like for an airplane wing, the convention for showing the forces acting on the hand is to break them down into a drag force and a lift force. The drag force acts in the same direction as the (oncoming) flow velocity. The lift force acts perpendicular to the flow velocity and points in the direction of inclination of the hand (relative to the flow velocity). The amount of inclination is given by the angle of attack. 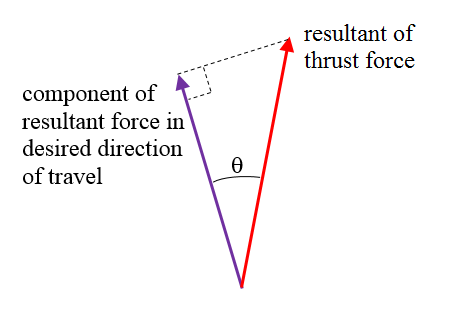 The magnitude of the lift force and drag force is related to the angle of attack. The resultant force is the vector sum of the lift force and drag force. 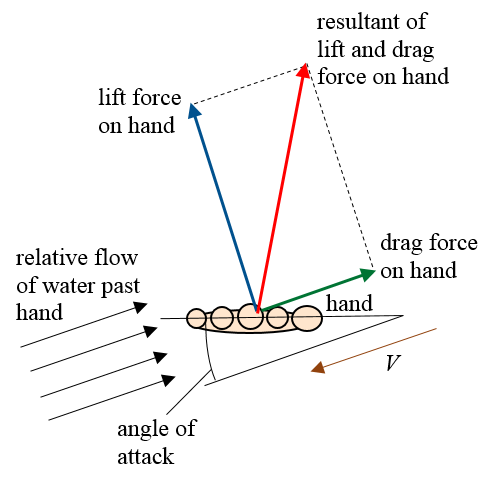 This is the actual force that acts on the hand (and is felt by the swimmer) as it moves through the water at velocity V.
Note that the swimmer can move his hands in any three-dimensional direction in the water, causing the lift and drag forces (and resultant force) to act in any direction also. The figure above shows a single case where the flow of the water is towards the palm of the hand at the shown orientation. Swimmers use a complicated hand motion to generate the maximum thrust possible, depending on the swimming style used. This is illustrated in the figure below for the front crawl . Note that D is the drag force acting on the swimmer's hand, L is the lift force acting on the swimmer's hand, and R is the resultant force acting on the swimmer's hand. By moving his hand along an optimal path, as shown, and adjusting the orientation of his hand throughout (i.e. the angle of attack), the swimmer can maximize the resultant force and keep it pointing forward as much as possible. The ability of a swimmer to do this comes down to his "feel" for the water, which is a function of swimming talent. The hand is represented schematically by a wing which, as explained previously, experiences lift and drag forces, as shown below . The lift force and drag force acting on an object moving through a fluid are both proportional to the square of the velocity of the object relative to the fluid. For a swimmer moving his arms through water the greatest lift and drag forces are exerted on the part of the arm that moves fastest through the water, which are generally the hand and forearm. The forearm also generates significant propulsive force in the form of drag. The lift force generated by the forearm is almost zero . This is because of its roughly cylindrical shape which makes it unable to experience a significant lift force no matter its orientation as it moves through the water. This is unlike a hand which can experience a lift force by tilting it against the flow of water. The upper arm is similar in shape to the forearm so the force it experiences is primarily drag as well. However, the literature suggests that the drag force experienced by the upper arm is negligible, which means that its relative velocity through the water is too low to produce significant drag force. For a competitive swimmer, the intent is to point the resultant thrust force in the desired direction of motion as much as possible. This is illustrated in the figure below. The part of the resultant force that is used for propelling the swimmer in the desired direction of travel is the component force, as shown. Through the use of proper technique the swimmer keeps the angle θ as small as possible, since this maximizes the amount of force that is used to propel the swimmer along. When a competitive swimmer moves through the water his intent is to maximize the thrust force generated which propels him along. In addition the swimmer desires to minimize the drag force experienced by his body as it moves through the water. This is done by keeping his body as straight as possible along the direction of travel. This has the effect of minimizing his frontal area in the direction of motion, which minimizes pressure drag. The figure below illustrates this concept . 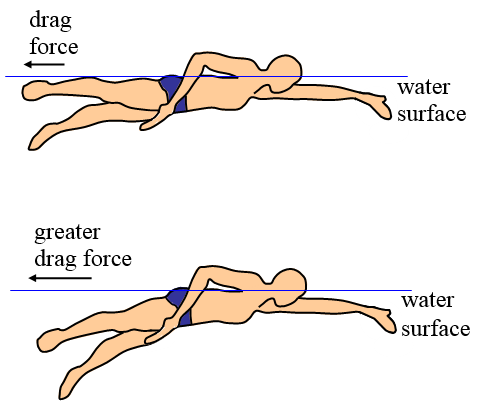 Note that the drag force that a swimmer wishes to minimize is the drag force resisting the movement of his body through the water. This is different from the drag force generated by the swimmer's arms and feet as he moves them through the water. In this case the swimmer wants to maximize this drag force since this is what propels him forward. 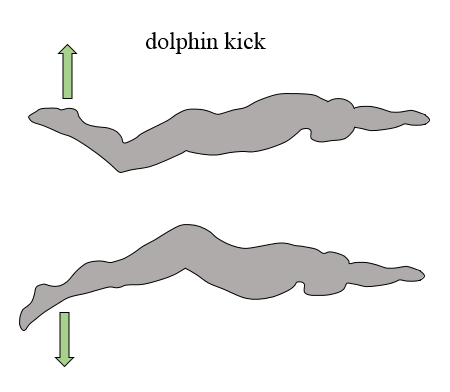 In competitive swimming the dolphin kick is used to maximize the speed at the start of the race and after the turns in all the swimming styles besides the Breaststroke. Swimming underwater using the dolphin kick is more efficient than swimming at the surface because there is one less source of drag, known as wave drag, which is generated when swimming at the surface. Elite swimmers can propel themselves at up to 2.5 m/s underwater using the dolphin kick. This is comparable to the top surface speeds reached by elite swimmers. (Note that these swim speeds can be easily determined by looking at the world records for given swimming distances). 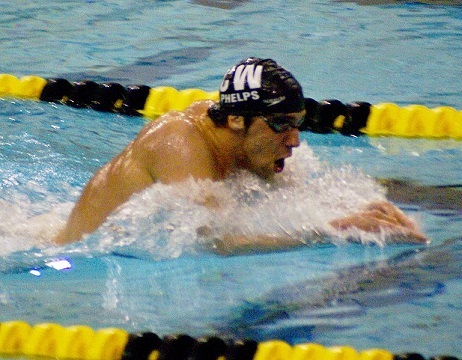 The undulating motion of the swimmer "pushes" back on the water (creating thrust) using a wave-like motion, and due to Newton's third law the water pushes back on the swimmer, creating thrust propelling the swimmer forward. The specific action-reaction mechanics at work here involves the creation of swirling vortices around the swimmer, which is part of the physics taking place. This is quite a complex phenomenon however, and is a serious subject of study among sports scientists, involving the frequent use of Computational Fluid Dynamics (CFD) as an analysis tool. The complexity of the interaction between the swimmer's body and the water requires the use of CFD to help understand it. CFD is also used for optimization, such as for determining the optimal finger spacing for a swimmer to use in order to achieve maximum thrust. In study  it is determined using CFD that an optimal finger spacing of roughly 12° maximizes the drag force exerted on the hand (by the water). For those interested, reference  discusses in detail the biomechanics of the four swimming styles. 2. V. Gourgoulis et al. The effect of leg kick on sprint front crawl swimming, Journal of Sports Sciences, 2013. 3. H. M. Toussaint, A. P. Hollander, C. Van Den Berg, and A. Vorontsov. From "Exercise and Sport Science", Chapter: Biomechanics of Swimming, Publisher: Philadelphia, Lippincott, Williams & Wilkins, Editors: Garret W.E., Kirkendall D.T., pp.639-660, 2000. 5. A. E. Minetti, G. Machtsiras, and J. C. Masters. The optimum finger spacing in human swimming, Journal of Biomechanics, 42: 2188–2190, 2009.